WASHINGTON, DC, May 20, 2013 (ENS) – To foster the adoption of fuel cell electric vehicles, the U.S. Energy Department has embarked on a new public-private partnership to develop the country’s hydrogen infrastructure. Dubbed “H2USA,” the new partnership brings together automakers, government agencies, gas suppliers, and the hydrogen and fuel cell industries. The stakeholders will coordinate research and identify cost-effective infrastructure that can deliver affordable, clean hydrogen fuel across the United States. Fuel cell electric vehicles are powered by hydrogen. FCEVs offer performance, range and refill time similar to combustion vehicles, and the quiet operation, zero emissions and power characteristic of battery electric vehicles. “Fuel cell technologies are an important part of an all-of-the-above approach to diversify America’s transportation sector, reduce our dependence on foreign oil and increase our competitiveness in the global market,” said Assistant Secretary for Energy Efficiency and Renewable Energy David Danielson. “By bringing together key stakeholders from across the U.S. fuel cell and hydrogen industry, the H2USA partnership will help advance affordable fuel cell electric vehicles that save consumers money and give drivers more options,” said Danielson. Current members of the H2USA partnership include the American Gas Association, Association of Global Automakers, the California Fuel Cell Partnership, the Electric Drive Transportation Association, the Fuel Cell and Hydrogen Energy Association, Hyundai Motor America, ITM Power, Massachusetts Hydrogen Coalition, Mercedes-Benz USA, Nissan North America Research and Development, Proton OnSite, and Toyota Motor North America. “The fact that a number of entities are coming together to work together through this partnership is a very positive sign,” said Morry Markowitz, president and executive director, Fuel Cell and Hydrogen Energy Association. Recent development of the United States’ shale gas resources is helping to reduce the costs of producing hydrogen and operating hydrogen fuel cells, said the Energy Department in a statement. H2USA will bring experts together to identify and solve key infrastructure challenges, including leveraging low cost natural gas resources. Through H2USA, industry and government partners will focus on identifying actions to encourage early adopters of fuel cell electric vehicles, conduct coordinated technical and market analysis, and evaluate alternative fueling infrastructure that can enable cost reductions and economies of scale. Infrastructure being developed for alternative fuels such as natural gas, as well as fuel cell applications including tri-generation that produce heat, power and hydrogen from natural gas or biogas, may also provide low cost hydrogen for vehicles. In addition, increased fuel cell deployment for combined heat and power, back-up power systems and fuel cell forklifts can help pave the way for mainstream hydrogen vehicle infrastructure. 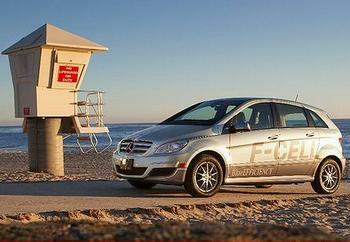 Several automakers plan to introduce fuel cell electric vehicle to the California commercial market beginning in 2015. Among the models on deck are: the Chevy fuel cell EV, the Honda FCX Clarity, the Mercedes-Benz B-Class F-CELL, the Nissan X-Trail, the Toyota FCHV-adv, and the Hyundai ix35 FCEV. Hydrogen stations are open, under construction and planned to support the coming vehicles. Costs are coming down and the Energy Department says with government support private industry and the Department’s national laboratories have already achieved some advances in fuel cell and hydrogen technologies. “These research and development efforts have helped reduce automotive fuel cell costs by more than 35 percent since 2008 and by more than 80 percent since 2002,” the Energy Department said in a statement introducing the new H2USA partnership. At the same time, the Energy Department says, fuel cell durability has doubled and the amount of expensive platinum needed in fuel cells has fallen by 80 percent since 2005.